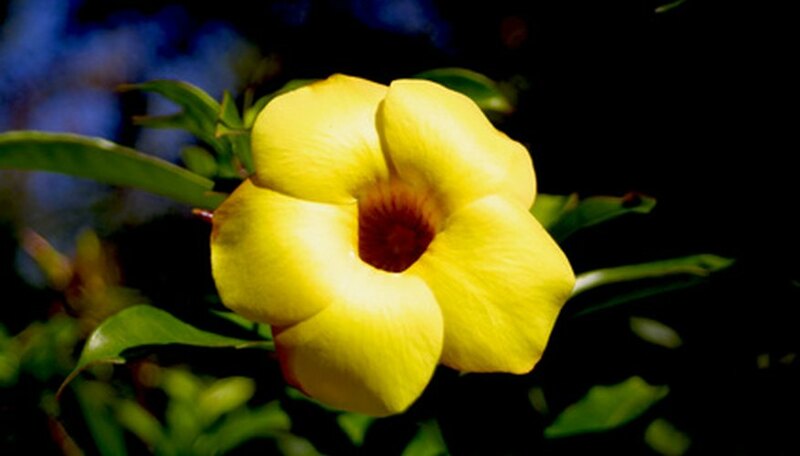 Native to Africa, black-eyed Susan vines (Thunbergia sp.) are annual flowering climbers that produce showy, bright orange blossoms with dark brown centers. Black-eyed Susan vines bloom throughout summer and into the fall, growing vigorously to a height of 8 feet or more. These annual vines are easy to care for and will provide continuously blooming often up until the first frost. Although black-eyed Susan vines are fast growers, they aren’t aggressive or invasive in landscapes. Provide a climbing support for your black-eyed Susan vine. You can grow your vine to climb on an arbor or trellis, on a fence or even up a tree. Water your black-eyed Susan vine deeply to soak the soil down to and around the roots once each week in the absence of rainfall. Provide water directly to the soil at the base of the vine to avoid wetting the leaves and flowers. Feed your black-eyed Susan vine once every six to eight weeks with a liquid 5-10-5 NPK fertilizer, according to the dosage instructions on the label. Spread a 3- to 4-inch-thick layer of organic mulch on the ground around your black-eyed Susan vine to control weeds and preserve soil moisture. You can mulch with bark, wood chips, leaves or other organic materials. Deadhead the black-eyed Susan vine throughout the summer and early autumn by removing the faded flowers. Picking off the spent blossoms will encourage re-blooming throughout the season. Plant your black-eyed Susan vine in spring when all danger of frost has passed and the soil has warmed, in moist but well-draining soil. Select a planting site for your vine that's in full, direct sunlight or a spot with some shade in the afternoon if you live in a hotter climate. Don't over-water your black-eyed Susan vine. The vine enjoys moist but not soggy or waterlogged soil. Also, avoid planting your black-eyed Susan vine near a blacktop driveway or brick wall that will radiate intense heat during summer.